Details: Military Blankets and Sound recording of California birds and US military aircraft. University of the Pacific Reynolds Projects Gallery. 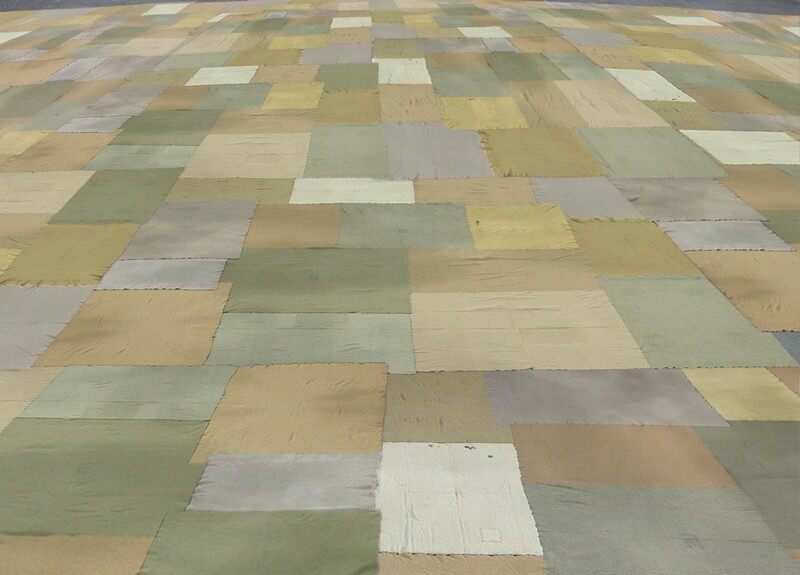 Field is an installation with shifting viewpoints, a proposition that violent action abroad is intrinsic to the American “heartland.” From one vantage point, the military blankets laid end to end on the floor resemble agricultural fields as seen from the air, conjuring farmland and notions of the heartland or homeland. The sounds of birds, airplanes and helicopters suggest an aerial orientation alternating between bucolic nature, air travel, and surveillance and military activity. However, the details in the blankets, the military insignia, hand-embroidered initials, patches, tears and stains suggest the irreducible scale of the body and instrumental injury. Field conflates land and body, the collective and the individual, the technological and the domestic.